Bicircular High-Harmonic Spectroscopy Reveals Dynamical Symmetries of Atoms and Molecules. 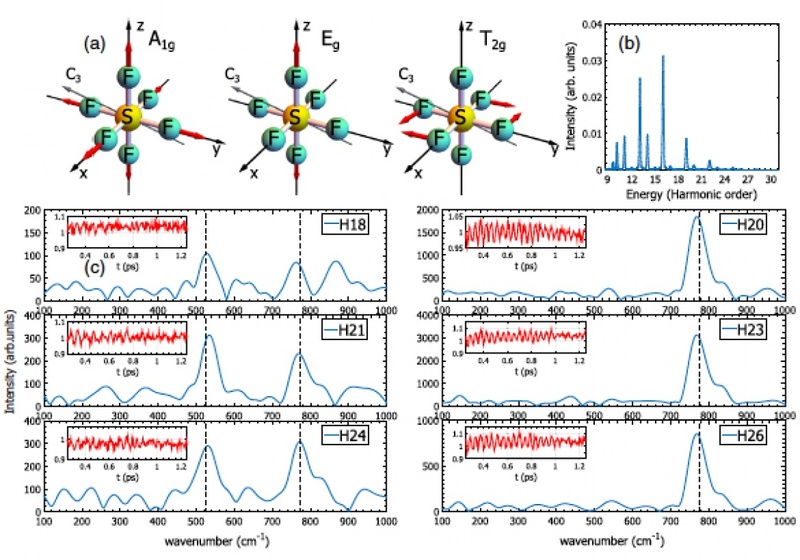 Denitsa Baykusheva, Hans Jakob Wörner and co-workers introduce bicircular high-harmonic spectroscopy as a new method to probe dynamical symmetries of atoms and molecules and their evolution in time. Their approach is based on combining a circularly polarized femtosecond fundamental field of frequency ω with its counterrotating second harmonic 2ω. They demonstrate the ability of bicircular high-harmonic spectroscopy to characterize the orbital angular momentum symmetry of atomic orbitals. Furthermore, they show that breaking the threefold rotational symmetry of the generating medium—at the level of either the ensemble or that of a single molecule—results in the emission of the otherwise parity-forbidden frequencies 3qω ðq ∈ NÞ, which provide a background-free probe of dynamical molecular symmetries. Fig. 1. Distinction of symmetrybreaking and symmetry-preserving molecular vibrations. (a) Sketch of the structure of the SF6 molecule. The blue arrows indicate the nuclear distortions along the three Ramanactive modes. (b) HHG spectrum of SF6 in the absence of the pump pulse. (c) Fourier spectra of the harmonic signals obtained after excitation by a linearly polarized excitation pulse. The spectra in the left column pertain to the parity-forbidden 3q harmonics. The insets contain the corresponding temporal profiles. Bicircular HHS has a broad range of innovative applications. The sensitivity of the polarization of the emitted harmonic radiation to the angular momentum of the highest-occupied orbital of the generating medium provides a convenient pathway for isolating XUV radiation with a specific helicity. Potential applications of this aspect include the generation of isolated elliptically polarized attosecond pulses. Extending BHHS to molecules, we demonstrated its extreme sensitivity to both electronic structure (shape resonance in N2) and symmetry breaking at the ensemble level. Working with vibrationally excited molecules, the authors showed that BHHS discriminates between symmetry-breaking and symmetry-preserving modes. These principles can be applied as a background-free probe of symmetry-breaking process, such as the Jahn-Teller effect. The two-dimensional nature of the electron trajectories and the wider range of recollision angles spanned by the returning electron provide new pathways for developing the self-imaging aspect of HHS, which will give access to attosecond time scales. These properties are expected to extend to BHHS of solids, where it will open up promising directions, such as the time-resolved study of symmetry and symmetry breaking in crystals. Reference: Baykusheva, D., M. S. Ahsan, N. Lin and H. J. Wörner (2016). Bicircular High-Harmonic Spectroscopy Reveals Dynamical Symmetries of Atoms and Molecules. Phys. Rev. Lett. 116: 123001 (10.1103/PhysRevLett.116.123001) Baykusheva-2016 (703 KB).